This is a one-pot wonder. Everything gets baked on one tray and the chicken comes out juicy and succulent. 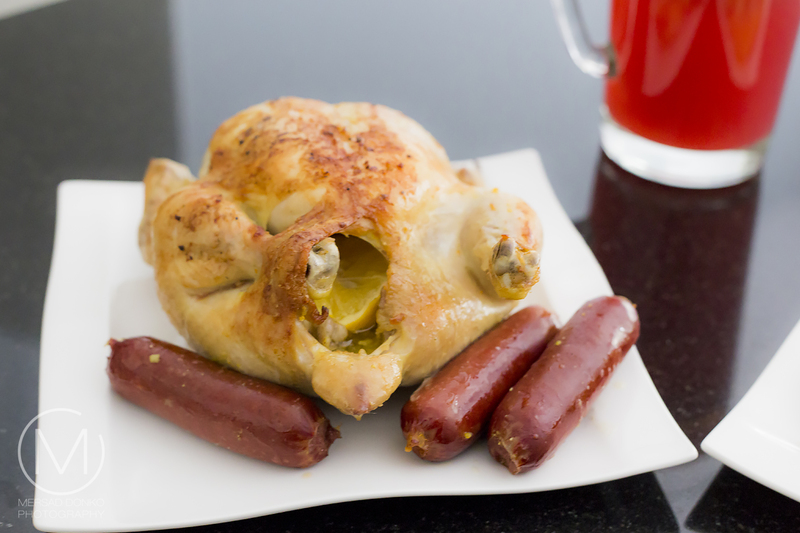 I sometimes even add sausages, though they are not a must since you have the meat from the chicken. 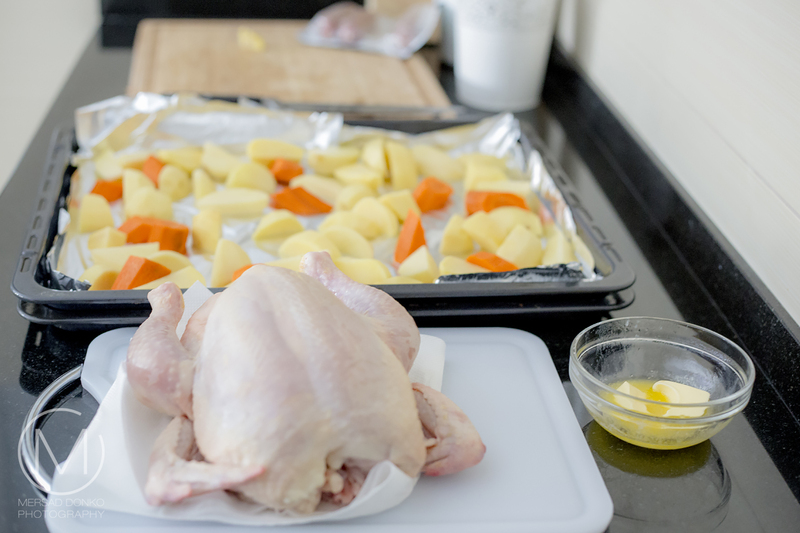 This Roast Lemon Chicken with Carrots and Potatoes Recipe is easy and put together in moments. The chicken gets stuffed with Lemons and seasoned well, so that you get a nice crispy skin and soft and moist meat. This works well on weekends when you have a crowd over, and I can even see this on your Christmas table as a main dish. 1. Preheat your oven to 200C (400 F). 2. 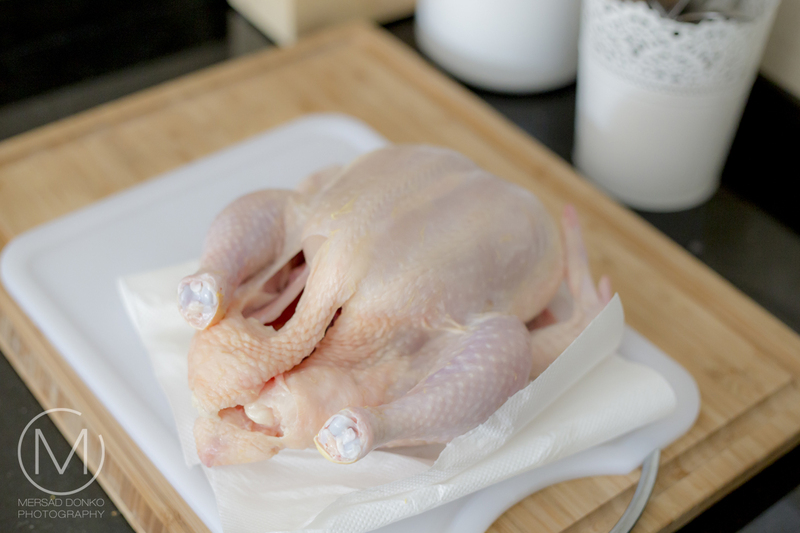 Wash and rinse the chicken to clean it completely. Pat with paper towels to dry completely. 3. Spread the butter all over the chicken. Make sure the get inside the cavity as well. 4. Salt and pepper the chicken all over. 5. Wash your hands thoroughly after handeling the chicken, and cut up some potatoes and carrots. Make the size a bit bigger, the chicken will be in the oven for 75 minutes. 7. Place the chicken on top of the vegatables. 8. Roast in oven for 75 minutes or until the juices of the chicken run clear and no pink meat shows. If the top of the chicken gets to brown cover it with aluminum foil until the rest of it bakes. 1. Place all ingredients (except the soup pasta) in one heavy duty pot. 2. Bring everything to a boil over high heat, then reduce the heat to medium-low and let it simmer for an hour. 3. After an hour drain the soup through a colander in a big bowl. Discard the chicken, but pick out the carrots and parsnip. 4. Return the liquid to the pot, add the pasta, mash up the carrots and parsnip and add it back as well. 5. Cook until the pasta is cooked through. Storing tip: You can freeze the soup in a plastic airtight container after the soup as cooled down completely, and then reheat later. 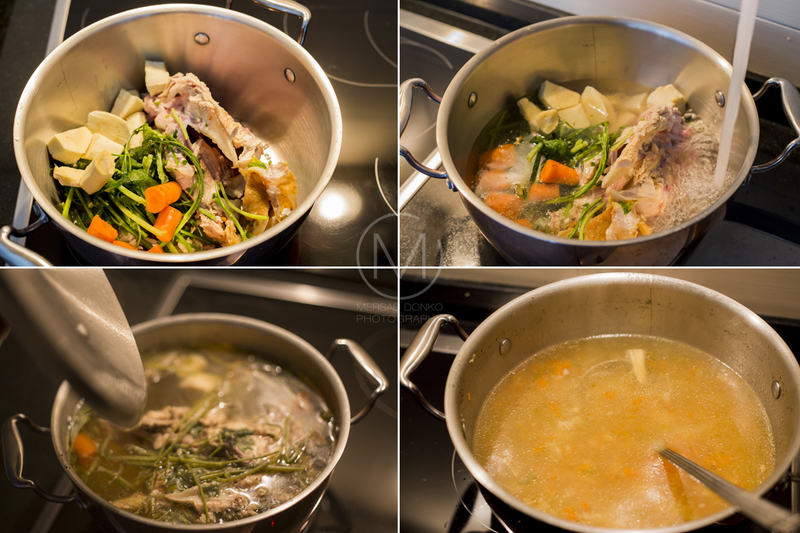 Chicken Stock tip: Stop after step 3, and add the chicken soup (which is essentially a stock) to a plastic container and use later as fresh stock for risotto and similar dishes. You can freeze it just like the soup. I hope you enjoyed this somewhat lengtly recipe post, but I just love that fact how far one roasted chicken can go. I save leftover meat for sandwiches, burritos, wraps and other similar dishes. I also posted another recipe today for pink lemonade. If you haven't seen it click here to view it. 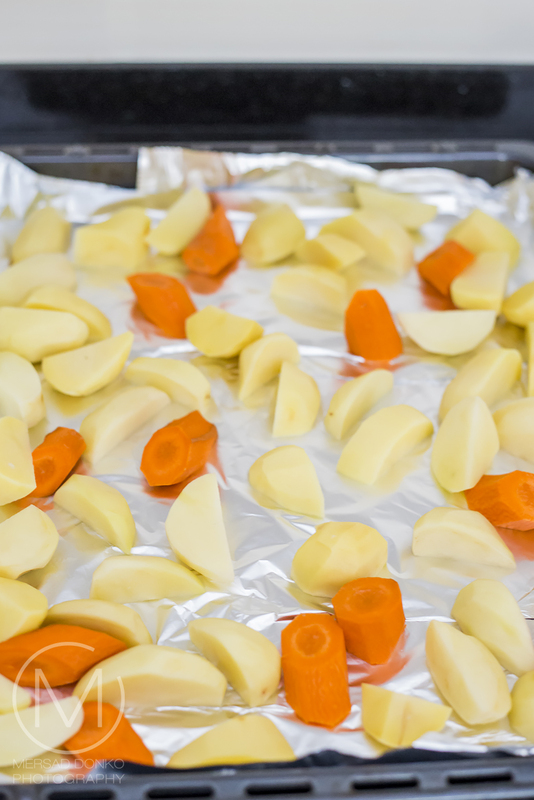 I love potatoes and carrots done this way, i do them for the two of us in our small convection oven. sometimes i add slices of sausage in with them. The homemade chicken soup looks wonderful! A one-pan roasted dinner like this is delicious and easy during busy times. Your version looks yummy. Soup for the next day is an added bonus. Oh, yes!! I do love roast chicken and veggies, too!! This sounds/looks delicious!! I've got to try it this weekend!! Thank you so much, as always, Mersad!! 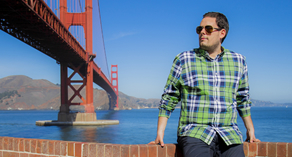 I hope your week is going well!! This is so up our alley! 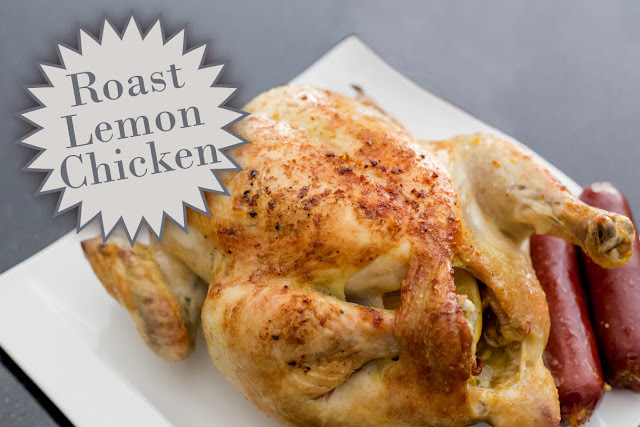 We love to roast a chicken weekly in the cooler months. I have not tried roasting with veg on the bottom of the tray, but we do make soup from the leftover bit! Wonderful. I love the addition of ginger to your soup recipe; will try it.